Years in Running (competition): 11 yrs. Shoe type: Light weight, lower profile, closer to “minimalist”. Injury history: None in last 2 years. Achilles/IT Band in college. Zach Bitter is an up and coming, elite ultrarunner. With physical gifts, work ethic, and dedication, Zach has the potential to set course records in every distance of our sport. Zach has yet to toe the line of his first 100k or 100 mile. Only time will tell what his aerobic engine can muster in those distances. Last year, however, he ran the fastest 50 mile in the country. His humble attitude and determined focus makes him one of the most inspiring athletes I have ever interviewed. I hope you enjoy my conversation with ultrarunner, Zach Bitter. Q: Good morning Zach. 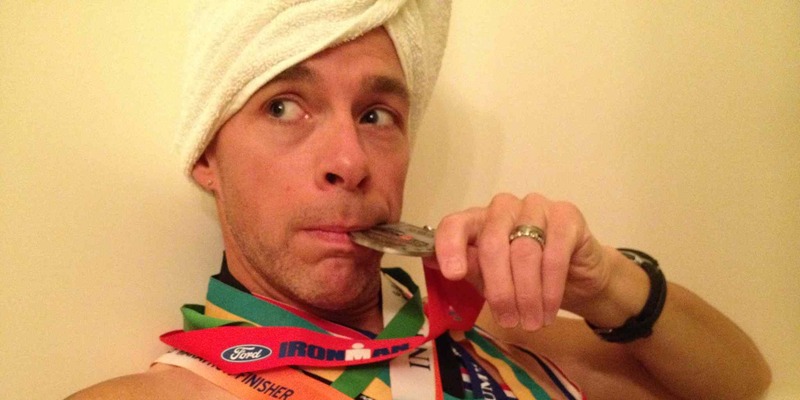 Can you please tell us about your athletic background prior to ultrarunning? A: I guess the first time I realized running was a competitive sport was in 6th grade when my physical education teacher had the class do the Presidential Physical Fitness Test. I didn’t really get serious about running until my sophomore year in high school. I went to small D3 high school and by my senior year I was an average state qualifier. I went to UW-Stevens Point and ran three years of cross country and two years of indoor/outdoor track and field under the tutelage of Coach Rick Witt. Our teams at Point were quite competitive on the DIII National level. I was an average runner on those teams. When I finished college I decided to dive right into marathons as I recognized I got better as the distance got longer. I debuted with a 2:36:08 marathon. Dreams of possibly lowering that time to the coveted 2:19 began to spawn in my mind. Unfortunately, my immediate plans of flirting with a qualifying time was thwarted by two hampered efforts in Des Moines, IA and Green Bay, WI due to hamstring issues and digestive issues. A bit frustrated by the uncertainty of the marathon game caused me to try my luck in my first ultra marathon. I had known in college I wanted to partake in ultras, but previously had not planned on doing so until I was in my 30s. The North Face (TNF) Midwest 50 Mile Regional, hosted in Wisconsin, immediately caught my eye. I signed up and the training began. I approached the race with a more cautious approach. I typically ran around 120 miles per week the summer leading into the race. I did a host of cross training including: swimming, biking, light weight training, and plyometrics. My peak week was 137 miles. I ended up doing quite well at the race. It poured rain for the first hour, but I managed to win the event with a time of 6:02:45. I was stoked and new then my ultra career would begin earlier than I had originally planned. I tested the marathon waters again the following spring in what I think was my best marathon shape. I ended up running 2:31:45 at the Illinois Marathon. It was interesting because I felt like I raced about as well as I could have, but was met with 40 mile per hour winds, and a finishing distance of 26.49 miles. 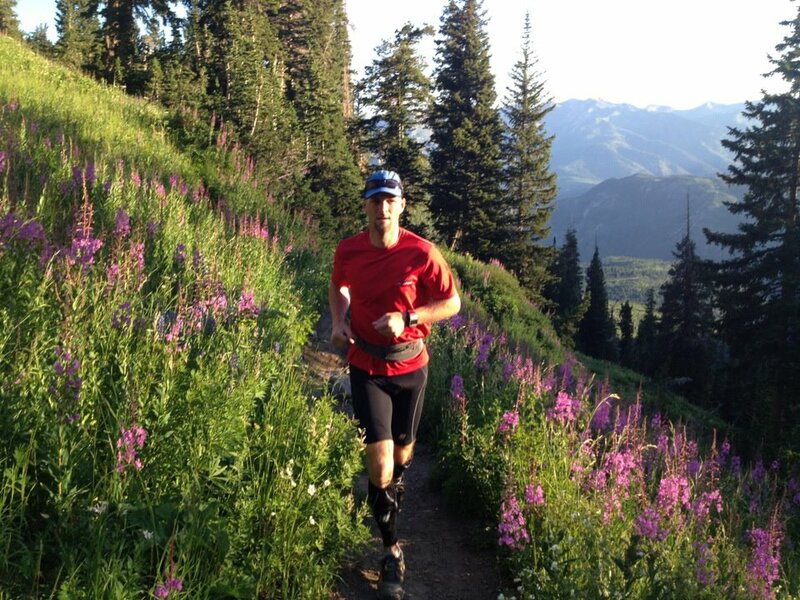 After that, I began training for a fall season of ultra racing, which are well documented on my blog. 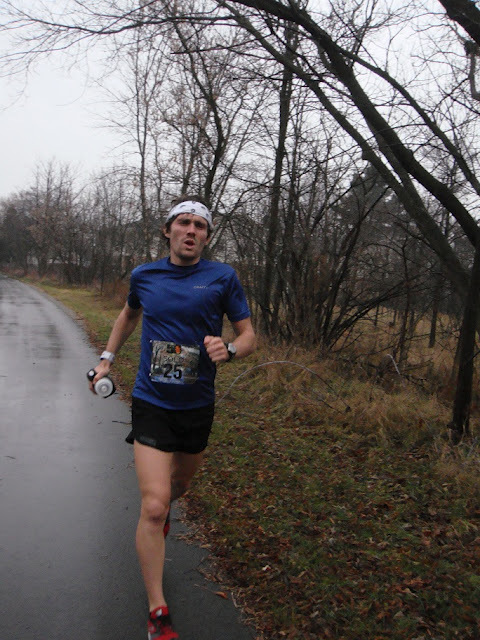 Q: In 2011, you ran the Fall 50 Mile Classic in 5:26:52, the fastest 50 mile of 2011. (That’s approximately 6:30/mi). Do you think it is possible to shave off another 15 minutes? A: I do think so, and hope to in 2012. The Fall Classic is road, and a fast course, but it is also a bit long, and has some challenging climbs and descents during the first half of the course. I am not the type of runner that outlines my entire season on January 1st, because I like to react to my training and race performance. With that said, at this point I plan to race the Chicago Lakefront 50 Mile Ultra, which is a four loop flat-as-a-pancake course. I will be gunning for 5:10ish… God willing my training goes well, and I do that race. Q: Holy moly…You’re gonna force me to start looking up world records to complete this interview. Your speed is on the way extreme of our sport… but being so new to ultrarunning, there must be something that challenges you. What about hydration, nutrition, injuries, heat, pace, etc… When you examine your own performance, what part your game needs work? How do you use that self-analysis to guide your training to peak performance? A: Excellent question. At this point in my career I would say really technical trails are difficult for me. This is mainly because I do not have immediate access to terrain of this nature where I live. I am doing my best to remedy this as I plan to take on some mountainous races in the not too distant future. I have been trying to improve, and feel I have been, by running up and down a local sledding hill. Sometimes bouts of 75+ repetitions within 30 mile training runs are what I do. Q: Dear Lord, Zach. That session is animalistic….very motivating for me, and our readers I’m sure! So what does a typical training week look like for Mr. Zach Bitter? A: It changes throughout the year. I am a middle school teacher, so summers differ a bit from school days. I will outline a week during the school year because it makes me look more dedicated. I start the week with a long run on Sunday. Typically between 20-30 miles. Monday through Friday mimic each other in time frame. I usually wake up between 4-5 am and run between 10-20 miles. After work I usually head out for another run, which is typically between in the 10 mile range depending on how many miles I ran that morning. During standard high mileage base weeks I aim for 20-25 miles during the Monday-Friday section of the week. I usually try to get a couple sessions of a combination of hills, tempo runs, fartleks, and pick-ups incorporated into my morning sessions. Saturdays I will try to get in a long run of 20-30 miles once again. I like the back to back long runs on weekends, because they really prepare you for lows during ultra races. But, realize, I do not do this routine week in and week out. I try to operate on a 3 week cycle of low (90-110mi), medium (120-140mi), and high (145-170mi). Q: Well, that seems reasonable! What motivates you to train when the weather is not cooperating…or you just aren’t feeling it? A: One thing I do is try to think about the hard work and talent of my competition. I do not see myself as someone who can compete at an elite level riding talent. I am blessed with the ability to churn out high mileage weeks without getting injured….so far, and really try to use that as motivation and a strategy. I also just love the act of running. It is exhilarating and one of the greatest releases I have been able to partake in, so real downer days are few and far between. Q: Awesome…Personally, I believe in hard work, not talent. And you demonstrate that. Tell me, who inspires you to be great? A: Roy Pirrung has been an inspiration to me for years. I have been blessed to meet him on a number of occasions. He is such a motivational figure, and one of the most positive and happy individuals you will ever meet. He has some spectacular stories too. Q: Totally! 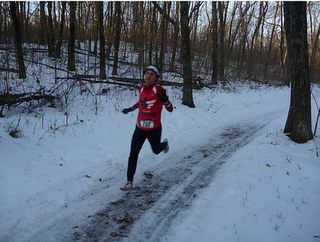 Roy Pirrung is synonymous with our sport…..a true ultrarunner at heart. An absolute in the track ultra scene. Zach, are there any products, nutrition, or devices you can’t do without? A: I do a lot of solo runs, so I love my ipod. I don’t have a lot of couch/tv time so podcasts keep me up to date on news, sports, and popular culture. I love training with Vespa. I am a firm believer in teaching the body to be efficient at fat metabolizing and like the benefits Vespa provides in this avenue. I also, take SportMulti as it is designed specifically for the type of lifestyle I live. I love the gear FuelBelt makes. It can be a pain to carry water and belongings along on runs, but FuelBelt makes an extremely non-intrusive product. Q: I’m sorry. I have to laugh when you mention Vespa… I’m allergic to bee venom so recently, I tried Vespa and told my wife ahead of time. I held my adrenaline pen and waited for an allergic reaction that never came. So funny… So, hell yeah, I dig the Vespa too. Tastes great. In training, what percentage of your training week is spent working speed vs. endurance? A: My training is largely endurance, but I do try to incorporate tempos, fartleks, and pick-ups into my training. Typically I try to amass 10-20 miles worth of a combination of these types of workouts in a week’s time. I don’t count races into that. Q: Please tell us about Team RWB, and what it means to you. Do you have a personal connection to this organization? A: TeamRWB focuses on returning war veterans. They provide opportunities for our service members to engage in endurance events. They recognize the difficulties that may present themselves before, during, and after serving our country. They also recognize endurance activities as great personal and physical opportunities for our service members. I am not personally a service member, but when asked by Mike Erwin to be part one of TeamRWB’s elite athletes I did not have to think twice. I have lots of friends and family members who are or have served. I really admire and respect these individuals and believe their work supports a country, which allows guys like me to chase goals and dreams. Q: Awesome…I’m a Marine Corps vet myself. Thank you for supporting that mission. What are your intermediate running goals (1-2 years ) and what are your long term goals (3-5 years)? A: Great question. I would like to build my ultra resume in the next year by adding more quality races in the 50k-100k distance. At some point in the next couple years I would like to compete for Team USA’s 100k Team. I currently plan to debut in the 100 mile distance sometime next year, but if you had asked me this two years ago I wouldn’t have thought I would be doing ultras at all before age 30, so who knows maybe sooner. In 3-5 years I hope to have been competitive in all ultra distances from 50k to 100 miles at some of the most historic venues, such as Western States, and Leadville. Q: Thanks Zach. 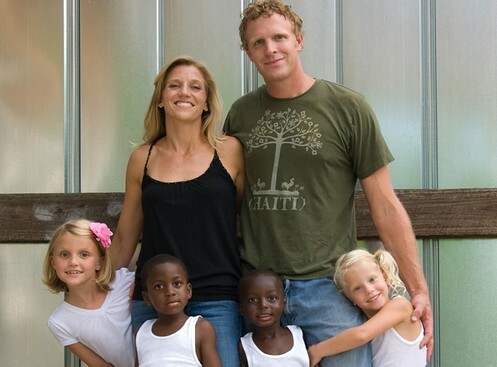 Our conversation will be read all over the world…by a diverse range of athletes. What words of wisdom might you offer them as they lace up their shoes and step out the door? A: Not everybody has the opportunity to partake in the sport of ultra running. Don’t ever take for granted… the health, mental fortitude, and determination it takes to pursue endurance. Always stay positive, because even the worst running day makes for a great day! Q: Run long brother…..you’re an inspiration. See you on the trails! I don’t think it’s going to take him 3-5 years to get competitive! Looking forward to watching him mature in the sport. Thanks for the interview!